Madame Bonnie is a third generation natural-born psychic, and has been practicing professionally since 1974. Madame Bonnie can help you unblock negative forces, find your inner self, reunite with loved ones, resolve relationship issues, and overcome your fears and bad habits. With her assistance, you can evaluate your priorities and choose your life's path, reach profound insight, and unlock your full potential. Telephone readings are available. Look into your past ... examine your present ... explore your future! Psychic Reading with this Coupon! Please complete this form. 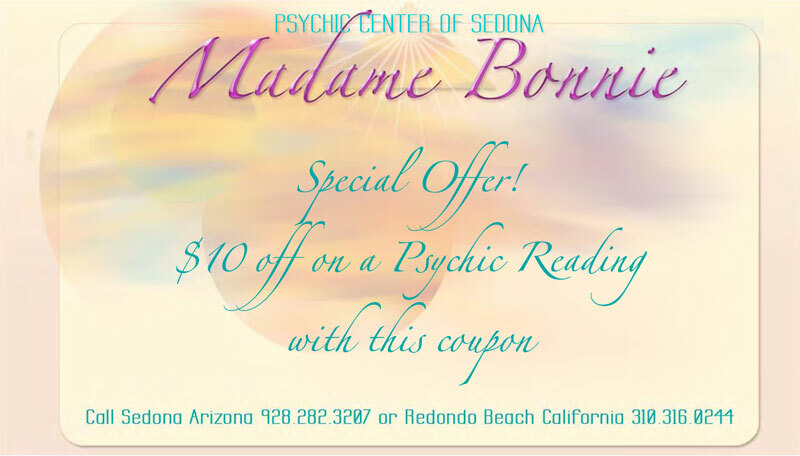 Madame Bonnie will be in touch with you shortly to schedule your appointment, or you may call Sedona Arizona 928.282.3207 or Redondo Beach California 310.316.0244. NOTE: All readings are private and confidential! We never share or sell your personal or contact information to any other person or entity for any reason. In Person Readings by appointment only. Please schedule your appointment with Madame Bonnie before making payment for In Person Readings. All readings are private and confidential! At the Corner of Pacific Coast Hwy. and Beryl St.